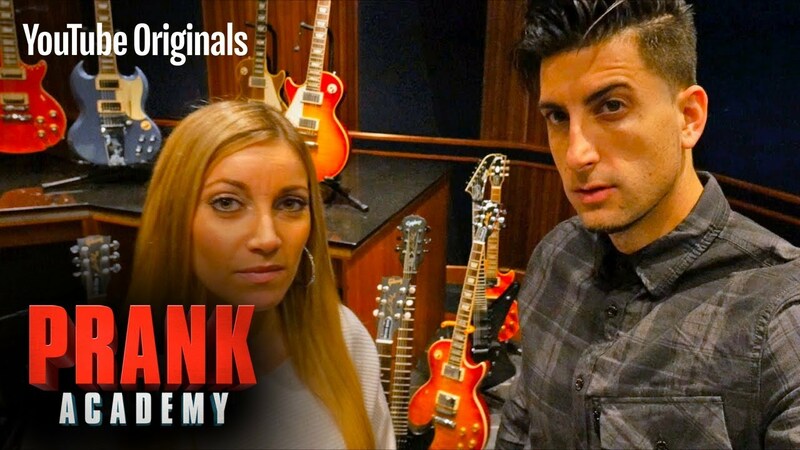 Jesse Wellens and Jeana Smith from Prank VS Prank have brought pranking to a whole new level on their original YouTube Red show, Prank Academy. Prank Academy is filmed like an actual TV show, with an entire crew and set backing up the two YouTubers. Jesse and Jeana act as Prankster Teachers to help their friends pull off insane pranks. Each participant must hit three objectives to “pass” the Prank Academy. Premiering on March 30, the first episode was free for everyone with or without YouTube Red. “Girl Caught on Fire Prank” features iJustine (Justine Ezarik) pranking Joey Garceffa into thinking he set a woman on fire. The rest of the Prank Academy will require a YouTube Red account, which unfortunately does cost money. But don’t worry, Jesse and Jeana have their fan’s backs with a free thirty day trial, and with the prank part of the TV show for free on their channel (better explained in this video). For those who don’t want to pay for a full subscription, Emertainment has the backs of our readers with a full review on Prank Academy episodes! The second episode of Prank Academy, “Stolen Song Lyrics Prank,” features Charles Trippy, one of the original daily vloggers, pranking Travis Clark, the lead singer and songwriter for their band We the Kings. With the help of two actors, they make Clark believe he ripped off another band’s song with “Check Yes Juliet.” The actor starts off by casually playing the riff of the song, and then singing the made up lyrics to “Say No Indigo,” a song by the fake band Field Promises. Initially thinking it wasn’t possible, the actor nails Clark in a moment of confusion when he admits to recording “Check Yes Juliet” in New York City around the time that the fake band was playing there. With “Field Promises” being popular around 2003, and “Check Yes Juliet” being written and recorded in 2007, Clark is in disbelief that he may have accidentally picked up the melody from another band subconsciously. When another actor comes in confirming the fake band’s name and song, Clark actually leaves the room flustered and confused. Though Trippy is able to lure him back in, they give him a fake guitar, rigged to break the moment he picks it up. After all is said and done, Clark was more relieved in the fact he didn’t rip off another band’s song than breaking a Gibson guitar! This prank was perfect to pull on a singer songwriter, and was done extremely well on Trippy’s behalf. Referred to as “cryptomnesia,” or unconscious plagiarism of someone else’s work, many other artists have accidentally rewritten the melodies of songs they’ve heard before. With the recent Thicke v. Gaye case concerning songs “Blurred Lines” and “Got to Give You Up,” it was no wonder that Clark was second guessing himself on one of his most popular songs. On a 1-5 scale of epic pranks, this one would receive a 2 in epicness, but a 5 in success. Clarke 100 percent believed he may have stolen lyrics from another artist, which was hilarious to watch. Though the prank itself was pretty low key, and the broken guitar at the end could have ruined it all. In reality, what are the chances of a professional musician picking up a Gibson guitar and the neck just snapping off? Unlikely. This aspect of the prank bumps it down a notch. The third episode, “Terrifying Crane Prank on Jesse,” was Jeana’s ultimate revenge on Jesse (finally!). After years of the meanest pranks, Jeana finally pulls off an epic revenge prank on Jesse, using his fear of heights against him. With the help of two expert pranksters from The Dudesons, Jukka Hilden and Jarno Laasala, she tricks Jesse into thinking that they’re pranking the other two Dudesons. The fake prank features Jesse being pulled through a fake wall where a prank went wrong and the wall “blew up.” In the rehearsal for the fake prank, stunt coordinators switch Jesse’s harness with one attached to a crane that lifts him 90 feet into the air. This prank leaves Jesse dangling by a small hook, facing his worst fear! As they lower Jesse down, Jeana, Jukka, and Jarno shoot at Jesse with paintball guns, Vaseline guns, feathers, and a baby powder cannon. While the prank of bringing Jesse into the air on a crane was awesome, the chicken feathers and baby powder were a little on the childish side for such master pranksters. The prank was already made epic through tricking a prank mastermind such as Jesse, and it would have been just as been good without the added humiliation on Jesse’s behalf. With that said, Jeana isn’t one to be mean in her pranks the way Jesse is, and she often doesn’t push the boundaries as hard. So pulling off this prank on Jesse was a major step up in her game! This prank received a 4 out of 5 on epicness, and a 5 for success. Jesse definitely didn’t know what was coming for him, but again with the childish feathers and baby powder, Jeana gets knocked down a point. The fourth episode, “Destroyed Birthday Cake Prank,” features Shay Carl, daily vlogger and podcaster, pranking his two brothers Logan McKay and Casey Lavere into thinking they ruined a girl’s birthday cake. The prank is pulled off with the help of two actors, one pretending to be a YouTuber baker who made the 5 tier cake, and one acting as the birthday girl, Emma. While Logan and Casey think they’re on a tour of the NYC YouTube space, they are led into the room with the birthday cake. The actor baker and Shay talk about how she spent over 3 weeks working on this gluten free rice flour cake that was inspired by the birthday girl’s wishes. When they are left alone in the room, Shay has his brothers go over and take a selfie with the cake, only for the trick legs on the table to give out causing the cake falls. Logan and Casey, devastated that the cake has fallen, try to figure out how to fix the table when the actor backer comes back freaking out the cake is on the floor. Then, as if matters couldn’t get worse, the birthday girl enters in a wheelchair, and starts crying that everything is ruined. The two brothers try to re-stack the 5 tier cake to no help, and are in complete disbelief of what’s happening. This prank was especially stressful for Jesse and Jeana when the trick table legs were giving out. Ten minutes before Shay and his brothers arrived, the crew was still trying to figure out how to get the trick legs to give out and cause the cake to fall. But to their luck the prank was pulled off perfectly, tricking both his brothers. This prank gets a 4 out of 5 for epicness, because while the prank was successful (also a 4 out of 5), having a birthday cake topple over isn’t really dramatic. It was only dramatic because of the actors making up the story for the cake, and that the actor birthday girl entered in a wheelchair. For success it receives a 4 out of 5 due to the fact that Casey definitely didn’t fully believe it was legit, but Logan did. While Casey was a little more skeptical than Logan, they both thought it was partially their fault! With 18 episodes in total, The Prank Academy still has 14 more weeks left of large scale pranking. Stay tuned each month to read full reviews on the rest of Prank Academy! From Prankster to Social Scientist: What’s Sam Pepper Doing?